Cut 1/4-inch off head of garlic and discard. Wrap garlic in foil and roast in 400 degree F. oven for 40 minutes. Meanwhile, place potatoes in large pot and cover with water. Heat and boil about 20 minutes or until tender; drain. 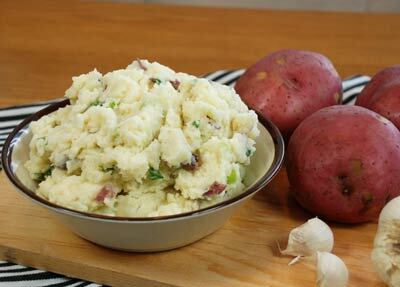 Slightly mash potatoes and add butter, sour cream, milk, Parmesan cheese, green onion, pepper and salt to taste. Continue mashing until smooth. Serve hot. Squeeze roasted garlic from head and stir into potato mixture.